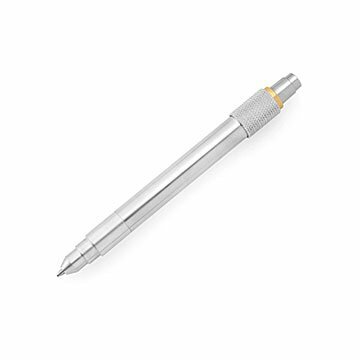 Satisfy your fidgeting side with this aluminum pen featuring a spinning ring. Cl-click. Cl-click. Cl-click. If you want to drive your co-workers nuts, just sit in a meeting and furiously click your pen in and out a thousand times. For a quieter option that still satisfies your innate need to fidget, try this sleek aluminum rollerball. Its action is clickless, but its irresistible, textured ring spins around the barrel when flicked with your thumb. It offers tactile distraction during marathon meetings or mind focusing when you're trying to brainstorm your next big thing. Best of all, the design doesn't scream "fidget spinner," so your daydreaming addiction remains discreet. It's a distinctive gift for coworkers, clients, or pen-loving collectors. Designed by Jac Zagoory. Made in Minnesota. Educated in jewelry design and fabrication at the Fashion Institute of Technology in New York City, Jac Zagoory found early inspiration as a metal sculptor, applying essential elements of design to his creations. After spending a year in the Asia and Europe, he began his "cylindrical obsession" with pens. Realizing the growing need for desk accessories that not only created order but also highlighted the individual, the artist began designing an extensive assortment of desk accessories that exist as art in and of themselves. With his vision, the office, the home, and the desk have become places where great beauty melds with function. My husband loves the ability to look adult while he fidgets. I do too!